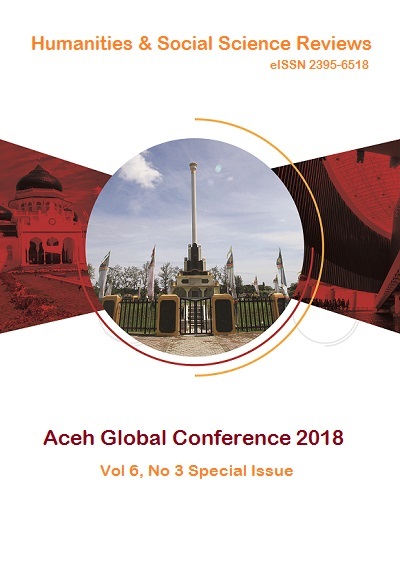 ENVIRONMENTAL FACTORS AFFECTING TRADITIONAL FISHERMEN IN MAINTAINING THE RESILIENCE OF MARINE AREAS IN THE CONTEXT OF INDONESIAN STATE DEFENSE | Humanities & Social Sciences Reviews Articles invited for Vol 7, No 2 issue. Upload before 30th May 2019 in Make a Submission tab. Purpose of the study: The purpose of this study is to empirically examine the factors that influence traditional fishermen in maintaining the resilience of marine areas in order to defend the country and examine the model of causality relationships that are formed as well as the influence of causality between these variables. Methodology: The study was conducted in the Depok coastal area, Bantul - Yogyakarta with traditional fishermen as the respondents who are members of the Mina Bahari Fishermen Cooperative. Hypothesis testing was based on Partial Least Square. Main Findings: This study found: (1) 15 reflexive indicator statements form 7 latent variables that directly to construct a hypothesis; (2) a state defence model is formed; (3) hypothesis testing model shows that the seven proposed hypotheses are accepted, namely: a) Knowledge of environmental security has a positive influence on attitudes towards environmental security; b) Attitudes towards environmental security and environmental influences have a negative influence on actions against security disturbances; c) Understanding the environment has a positive influence on environmental awareness; d) Environmental awareness, environmental influences, and actions against security disturbances have a positive influence on participation in the environment. Applications of this study: This study helps inform the stakeholders establish coastal resilience program by incorporating the fishermen in the coastal areas. Novelty: Few studies paid attention toward traditional fishermen to keep marine resilience in Indonesia. 1. Bollen KA, Lennox R. (1990). Latent Variables in Psychology and The Social Sciences, Annual Reviews. Psychol. 2002. 53:605–34. 2. Chin, W.W. (1998). The Partial Least Square Approach to Structural Equation Modellng in Modern Methods for Business Research. America: Lawrance Erlbaum Association Publisher. 3. Hair. F Jr, J., Sarstedt, M., Hopkins, L., & G. Kuppelwieser, V. (2014). Partial least squares structural equation modeling (PLS-SEM) An emerging tool in business research. European Business Review, 26(2), 106-121. 4. Hayes, Andrew F. (2013). Bolin, J. H. (2014). Introduction to Mediation, Moderation, and Conditional Process Analysis: A Regression‐Based Approach. New York, NY: The Guilford Press. Journal of Educational Measurement, 51(3), 335-337. 5. Joshi, A., Kale, S., Chandel, S., & Pal, D. K. (2015). Likert scale: Explored and explained. British Journal of Applied Science & Technology, 7(4), 396. 6. Luthans, Fred, Brett C. Luthans, Kyle W. Luthans. 2015. Organizational Behavior: An Evidence-Based Approach. 13th Ed. New York: McGraw-Hill. 7. Pearce II, John A., dan Robinson, Richard B. 2011. Strategic Management: Formulation, Implementation and Control, Twelfth Edition. New York: Mc Graw Hill. 8. Sastrawidjaya. (2002). Nelayan Nusantara. Jakarta: Pusat Riset Pengolahan Produk Sosial Ekonomi Kelautan dan Perikanan. 9. Thompson, James D. (2003) (1967). Organizations in Action: Social Science Bases of Administrative Theory (With a new preface by Mayer N. Zald and a new introduction by W. Richard Scott ed.). New Brunswick, New Jersey: Transaction Publishers. ISBN 0-7658-0991-5. 10. Orr, T., & Flowers, J. (2014). An experimental approach to everything!. Technology and Engineering Teacher, 73(8), 8-12. 11. Undang-Undang Dasar Republik Indonesia 1945. 12. Undang-Undang Republik Indonesia Nomor 45 Tahun 2009 Perubahan Atas Undang-Undang Nomor 31 Tahun 2004 Tentang Perikanan. 13. Undang-Undang Republik Indonesia Nomor 20 Tahun 1982 Tentang Pertahanan dan Keamanan. 14. Undang-Undang Republik Indonesia Nomor 39 Tahun 1999 tentang hak asasi manusia BAB IV Pasal 68. 15. Undang-Undang Republik Indonesia Nomor 3 Tahun 2002 tentang pertahanan negara, keikutsertaan warga negara dalam upaya bela negara.